Peon jobs in Raichur District Court. Interested candidates may submit application form online for this District Court Recruitment 2019. Official website is https://districts.ecourts.gov.in/india/karnataka/raichur/recruit. Candidate's selection will be based on skill test and interview. 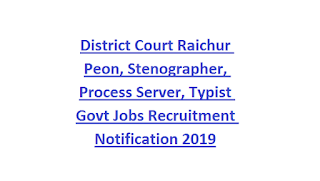 More information about this Peon,Stenographer, Process Server, Typist Vacancy in Raichur District Court recruitment 2019 is given below. 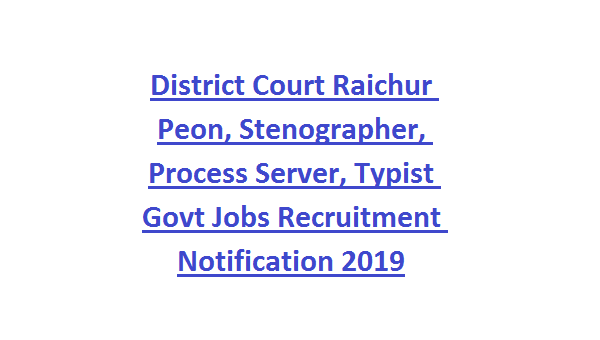 There are total 38 vacancies in this Raichur District Court recruitment 2019 notification. All the posts are reserved for Hyd Karnataka Local cadre. Candidates age limits are 18-35 for general, Cat 2a, 2b, 3a candidates age limits are 18-38 years and for SC/Cat1 candidates age limits are 18-40 years. Candidates selection will be through merit in qualifying exams and skill test, interview. Interested candidates may submit the application form online at official website of https://districts.ecourts.gov.in/india/karnataka/raichur/recruit district website. Fill the application with all required information and attach the attested copies of all required documents. Last date to reach the application form to Raichur District Court is 30-01-2019.